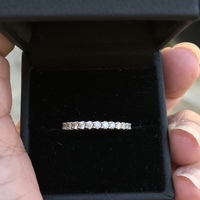 This listing is for a one of a kind modern 14kt white gold unisex 0.66 CTW diamond ring in size 8.5 featuring one 0.54 Carat Princess Cut Diamond in I color SI2 clarity with 2 small melee diamonds in the middle and one baguette diamond off to the side. 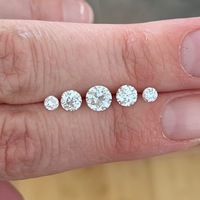 This ring weighs a solid 7.9 grams and is very comfortable to wear. $420 shipped USPS Priority Mail to anywhere in the continental United States and paid by USPS money order or Paypal. I am seller boostedonesix on eBay as a feedback reference. I just got this amazing band from Circe. I purchased it along with several other pieces to wear in a stack that my finger just couldn't support. This piece is too small for me to wear comfortably half the time but it took me a bit to decide to list it because it's just so beautiful. It's a size 5.5. The carre cut rubies are gorgeous, VERY red, despite looking slightly pink in photos. 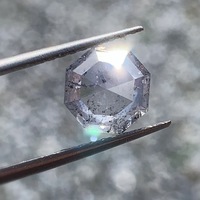 A few stones have some minor abrasions on the facets, but no gouges or chips at all. It's about 2mm wide and an absolute beauty! Circe had it listed for $950, but knocked it down to $900 for me since I was buying several pieces. I got a deal and I want the next person to as well. I am asking $825 which will include priority shipping plus insurance in the US. If you have any questions, please ask. Sales are final. Up for your consideration, is a nice 22k shell charm. It's petite (around 1/2 an inch) but makes up for it in richness. The charm is 3d and hollow. Email with any questions you might have. Thanks for looking. Shipping to US address confirmed only by paypal it is a final sale. New, never worn Saint Bernadette charm. She weighs 1.1 grams and her patronage is bodily illness, poverty and people ridiculed for their faith. With bail she comes in at around She is made by C&amp;G and was crafted in France. Let me know if you have any questions. Thank you for looking. Shipping to US address confirmed only by paypal it is a final sale. For your consideration, is a 18k yellow gold elephant pendant weighing 2.2 grams with diamond and sapphire accents. This one is pre-owned (another EBAY purchase) but is in good condition. The trunk is facing up which is a sign of good luck. Buy it and wear it when you get lottery tickets! Thank you for looking, contact me with any questions you might have thanks! Shipping to US address confirmed only by paypal it is a final sale. A cool little drama mask charm in 18k yellow gold. From bail to end it is around 1/2 of an inch. Perfect for the actor/actress in your life, or a drama queen. This one weighs 1.0 grams. Thank you for looking. Email me any questions about this one! Have a great day. Here is a nice vintage 22k gold Cleopatra charm. She weighs .7 grams and tested 22k gold, thus the gold test stain that was left on the back. Bail to end she's around 3/4 of an inch. Other than the gold test stain on the back, she's in good condition. Email me any questions you might have. Thanks for looking! Shipping to US address confirmed only by paypal it is a final sale. Last obsession, I promise! A sweet little 18k tricolor teddy bear that measures from bail to end 3/4 of an inch. He has never been worn and the lowest price the same bear goes for on ebay is $88. He weighs 1.7 grams and needs a new home. Email me with any questions you may have. Thanks! Shipping to US address confirmed only by paypal it is a final sale. Back in 2009, I visited the King Tut exhibition when it stopped in Dallas. I wanted a cool souvenir, but between the overpriced crap the upper end items were massively expensive. So I bought one on Ebay. Sold to me as 18K and tested as 14K, this one measures from bail to the end about an inch more or less, and weighs 2 grams. The old gal has seen better days, and could use a good cleaning. Email me any questions you might have. Thanks for looking! Shipping to US address confirmed only by paypal it is a final sale. This one combined my love for animals and Disney characters. A vintage pin/brooch in 18k yellow gold (tested twice) with a garnet eye. This one I got off ebay a few years ago and she has been sitting in my jewelry box with all the other pieces I have neglected to wear. She is 4.6 grams and a little over an inch long. Email me any questions you might have. Thanks for looking! Shipping to US address confirmed only by paypal it is a final sale. Up for consideration, a 14K two tone angel pendant/charm. The wings are rose gold and the angel is yellow gold. With the bail he/she/? measures a little over half an inch. Things with wings are another one of my obsessions, but again it's time to pare things down. Thanks for looking and email me anytime about this and my other items. Thanks! Another cat, yes I know. This one is a 14k rose gold (with white gold whiskers and cz eyes) cat. Another item sitting in a box being neglected. This one measures close to an inch and is .8 grams. Email me anything about this and my other items for sale. Shipping to US address confirmed only by paypal it is a final sale. Thanks! Jewelry and animals are two of my favorite things, what better way to combine the two, right? Another pair of tie tacs that I got off of EBAY. The combined weight is 2.7 grams and they both measure about 1/2 an inch. The bunny and panther are 18k the pin is not. Please email me any questions you may have. Thanks for looking. Shipping to US address confirmed only by paypal it is a final sale. Hello again, cartoon character jewelry is another one of my collecting obsessions but, I'm going to have to slim it down. For your consideration is a bugs bunny/daffy duck charm set. The bugs bunny alone sells for $79.00 on ebay, neither have been worn and I would feel weird sending bugs and daffy to be melted down. Contact me with any questions you may have. Thanks for looking! Shipping to US address confirmed only by paypal it is a final sale. Up for sale a nice little hummingbird pendant with a small ruby eye weighing 2.9 grams. The pin is in good shape. I collect bird jewelry, among other things, and am thinning out my collection. Contact me with any questions you may have. Have a great week! Shipping to US address confirmed only by paypal it is a final sale. Yes you heard right an eye glasses holder. I picked this one up at a gem show a few years ago, and this one really is for the person that has everything. He measures right an inch tall and weighs 5.9 grams. Email me with any questions you may have on this one. It's a conversation piece for sure! Shipping to US address confirmed only by paypal it is a final sale. Nice lionhead pendant in 14k yellow gold. He's hollow and weighs 2.8. grams. A nice bail with this one. Email me any questions you may have on this one. Thanks for looing! Shipping to US address confirmed only by paypal it is a final sale.